Whole Durum Pita ~ I Can Do That! I've never made pita before. I usually buy the 3-inch whole wheat from Wegmans grocery store. They are very soft and are the perfect size for small sandwiches or for dipping in lemony hummus swimming in fruity extra virgin olive oil. A few months ago I read about Jose Andres's teeny crispy air breads filled with some kind of creamy cheese and wrapped with thin slices of roast beef, his version of Philly Cheese Steak Sandwich. I don't know if the sandwiches are made with pita dough but the concept certainly inspired me to make pita. I used whole durum flour and made them into various sizes ranging from 3 to 5 inches, and a few ovals that are really tiny. It was fun to watch them balloon in the hot oven within a minute or two. 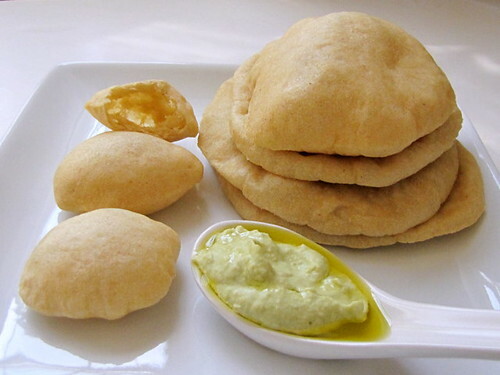 It is even more fun to eat the soft bread with green chickpea hummus. Green chickpeas have a sort of grassy earthy flavor and whole durum pita's perfect partner! In a small bowl, dissolve honey in water. In a medium bowl, mix ¾ cup of the flour and yeast then stir in the water and honey mixture. Cover with plastic wrap and let stand overnight or at least 4 hours until mixture is bubbly. Sprinkle salt on top and mix in the rest of the flour. The dough should be stiff and slightly dry. Add more flour or water as needed. Knead by hand until smooth and elastic. Divide into 8 equal pieces or desired sizes and roll each into a ball. Cover with a moist towel or lightly oiled plastic film and let the balls rest for 1 hour on the kitchen counter. Put a rack on the lowest position of the oven and place a pizza stone or an inverted sheet pan on the rack. Preheat the oven to 500°F. Cut a few rectangular pieces of parchment and lay one piece on top of a peel. Cut the sides and top of a gallon freezer bag. Open the bag and place a dough ball on the right side of the bag. Cover with the other side and flatten the dough balls into 6½-inch or ¼ inch thick rounds. [Tip: I use a small heavy skillet to flatten the dough to keep its rounded shape.] Place 4 pieces of flattened dough on the parchment and slide onto the hot sheet pan. Bake for 2 to 4 minutes or until completely puffed up. Remove with a spatula, transfer into a plate, and cover with a moist towel while baking the remaining dough. Enjoy while still warm. It is great you made pitas. I would have been meaning to try it but I haven't had the chance yet. Yours look great. I can't believe how soft and tasty they are. I'm thinking of getting a tortilla press which would make them easier to flatten.